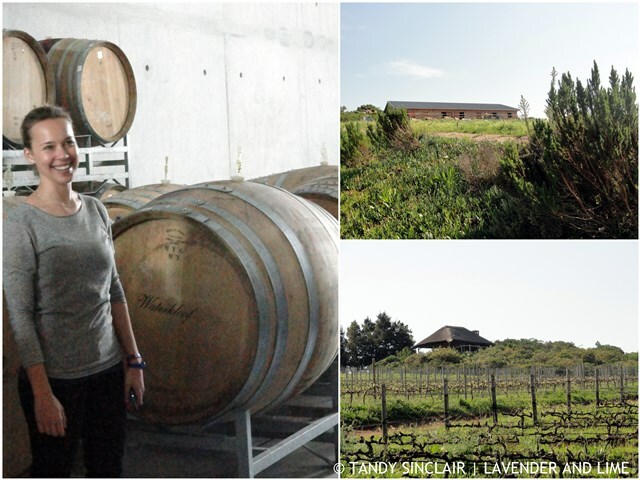 Nadia Barnard is the wine maker and cellar master at Waterkloof Wines and she is enthusiastic about what she does. 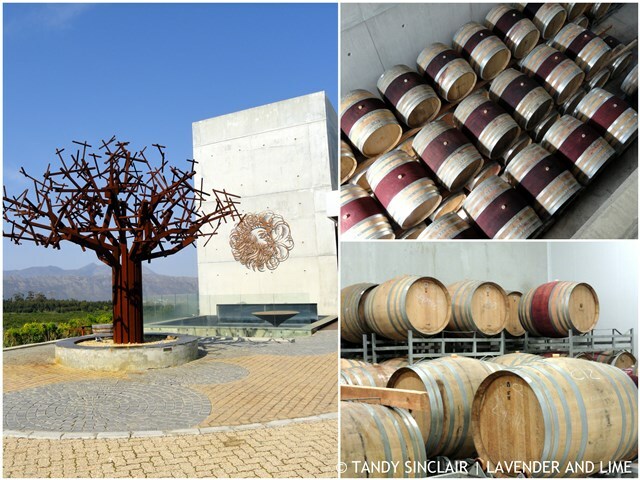 She started in the vineyards at Waterkloof in 2008, and explained to us how Waterkloof has gone back to basics. They farm bio-dynamically and use horses in the vineyards as their hooves do no damage to the soil. Waterkloof uses natural methods of controlling ‘issues’ that arise in the vineyard and to this end have their own earthworm farm, use horse and cow manure for fertilizer and even have rabbits roaming around. Chickens are used to control the weevils and sheep keep the cover crops short. When Paul Boutinot purchased the land, plenty of Bluegum trees were cleared to make way for the vineyards. There were a few existing vines and in 2005 a block of Sauvignon Blanc was the first to be converted to bio-dynamic principles of farming. Grapes are picked by hand and placed into crates that take 16 kilograms. These are then brought to the cellar by the horses and placed into a cooling room and left to cool overnight for freshness. This also inhibits the growth of bacteria. The grapes are then sorted by hand, with only the best grapes being chosen to make wine. The berries are placed into a tank and then dropped into a fermenter. The aim is to avoid any bitterness on the wines. The grapes are gently ‘stomped’ by machine to break the berries. Some of the grapes will be stomped the ‘old fashioned’ way by foot and Nadia encourages anyone to come along and assist with the chaos that is harvest. 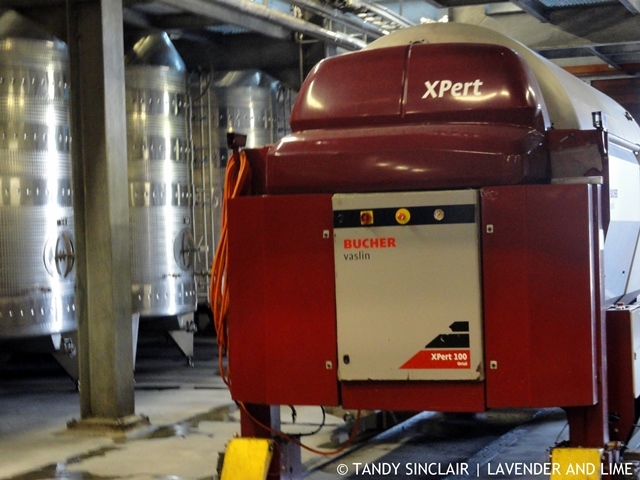 Energy is used to ferment the grapes naturally, with no yeast being added to the process and the lees are left in suspension. For example, Chenin Blanc will take 4 months to ferment naturally. The grapes will be left on the skin for about a month which leads to a longer alcoholic fermentation. This means that there will be no need to batonage. It also builds on the palate structure of the wine. By using natural fermentation the process can take up to 15 months and we saw this first hand last year with the 2013 Sauvignon Blanc. The red grapes will be placed into wooden fermenters which come from France, and these give off heat. Rhone varietals such as the Cinsualt, which is a bush vine, are taken off the stem and fermented in whole bunches. Pressing is done very gently to ensure the best wine. 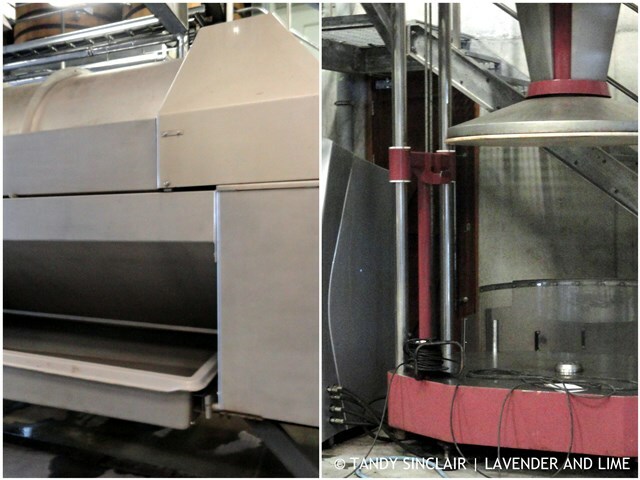 White grapes are pressed with a drum press in whole bunches and the basket press is used for red grapes. The juice will be tasted at this stage and then left to settle in a barrel or tank. Older vines have a lower yield as the berries are smaller and the fruit more concentrated. The Cinsault is barrel fermented in 600 litre barrels and then barrel aged for 9 months. Other Rhone varietals will be left in the barrel for between 15 and 16 months. 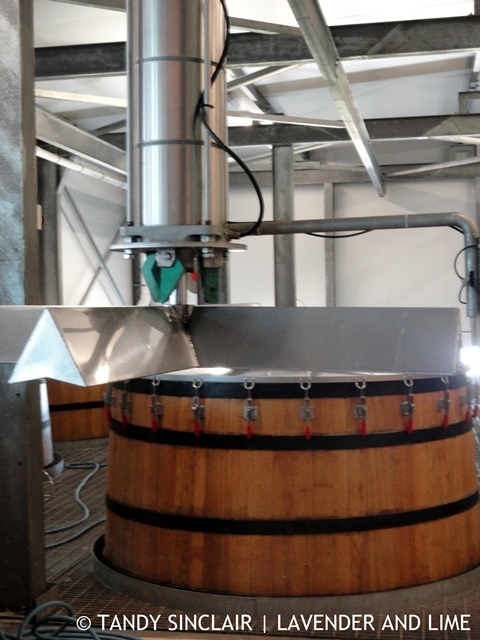 The Bordeaux wines will be placed into 225 litre barrels and 20 – 30% is aged in new oak. As Nadia says “the wines from Waterkloof express what is in the vineyard”, and in my opinion that is the most important reason why these wines are some of the ones of choice at my table. Disclosure: I was invited to attend the media lunch by Random Hat Communications as a guest of Waterkloof Wine Estate. I was not asked to blog about my experience. This post is in line with my blogging policy. Dave and I are away in France and we will be back at work on the 1st of October. I will start replying to blog comments then. You can read our daily diary of our trip by clicking here. That’s a great story you’ve shared about wine making. It’s sure do give lots to do when it comes to wine making. But also the result of your hard work will pay off when tasting the wine comes. On this winery, it sure gives enough knowledge on how they make a tasty wine. People will sure to visit this place with it’s wonderful winery outside the country. I really like to visit a place like this. The environment is great and tidy.Good to hear about your experience. Wow Tandy…I love the photos…such a great experience! Where is Lucille Ball stomping on the grapes? It is amazing how everything is automated these days. Looks like an amazing place. Hope you’re enjoying your trip!